Urban Goddess | Getting back to our roots! For people with interests in urban farming, gardening and organic and homemade foods and household and beauty products. I remember the first time I made butter… accidentally. I was a child and I thought it was one of the coolest things ever! I had no idea I could make my own butter in a KitchenAid mixer. I think I might’ve been trying to make whipped cream but forgot all about and just let my mom’s mixer keep running. 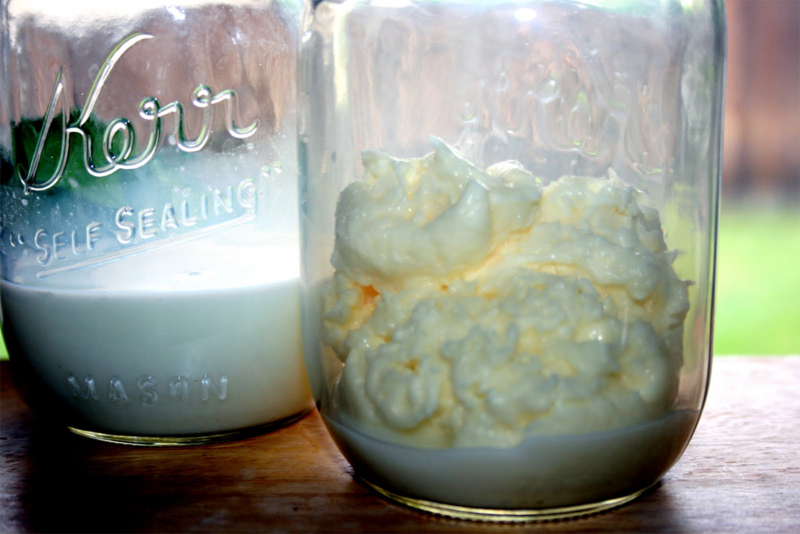 Years later, my sister Caryn introduced me to butter making via vigorous shaking of a jar. It was fun, it was faster than a mixer, and it was great exercise! For sweet butter, use 1 cup of cream and your favorite sugar or sweetener to taste. For plain butter, you just need to shake the cream with nothing added. It’s really easy and really delicious, and I recommend that you try it! If any of you already make your own butter, please share your favorite add-ins and your technique. Tags: butter, herb butter, homemade, homemade butter, making butter, sweet butter | Permalink. We are two sisters separated by many miles; I am in Los Angeles and Caryn is in Oregon, but we’re able to bond almost on a daily basis over shared interests of healthier living. Our goal is to build a community of sharing healthier living tips with others because we know how scary, difficult, and sometimes tedious it can be to begin a whole new lifestyle and eating habits. Growing up in central California, Caryn and I, and our brother, grew up with a mother who worked part-time and was always home when we got home from school. Those were the good ol days! Mom made dinner every night, and during the summer, she always made homemade jams, jellies and fruit butters. One summer she even made pickled okra! Yum!! We had a lot of fruit trees in our back yard, and every once in a while, me and my mom would grow vegetables and fresh herbs. During my teen years, I decided that I wanted some pet chickens. So, without my mother’s permission, I went to a local feed store and my friend and I bought three chicks. My mom and I were hooked, and my mom has had chickens for about 15 years now. Caryn has had chickens for several years as well, up in Oregon. Since moving to Los Angeles, it is very difficult to do gardening and to be a little more homemade, but it’s not impossible. I’ve said for years that I was born in the wrong era, and I’ve wanted to get back to my roots, so to speak. With getting older and the choice of food available at most large grocery stores, I feel I’m in need of a change. All the reports of GMO foods, and other garbage, is disconcerting and I want to take back control of what I’m consuming. As a community, we can do this together and make a healthier country! Let’s get back to our roots! Tags: food, gardening, health, healthier living, homemade, housewife, lifestyle, organic, urban farming | Permalink.